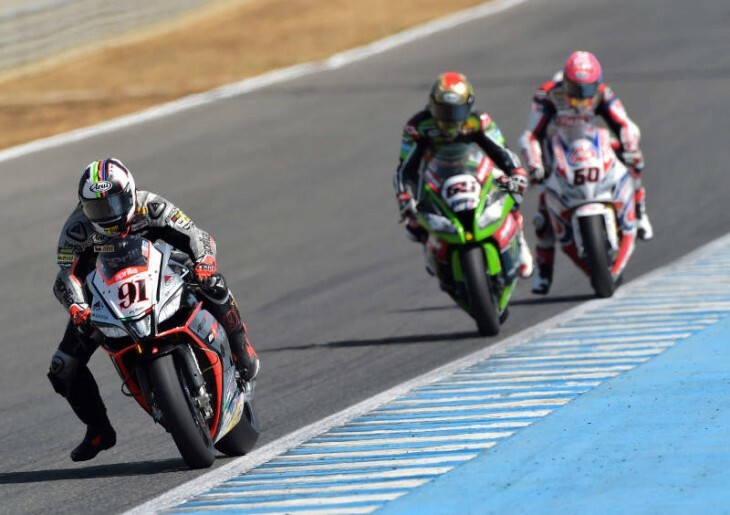 Jerez, 20 September 2015 – The Superbike weekend at Jerez de la Frontera ended with to Aprilia RSV4 machines on the podium. In Superstock 1000 FIM Cup just one point separates Lorenzo Savadori and his Team Nuova M2 Aprilia from the championship title after taking third in the race today. In Superbike home town hero Jordi Torres, who started the race from the second row, had some difficulties braking in Race 1 from the first laps, ending up in the middle of the pack and having to settle for a twelfth place finish. Leon Haslam made a great comeback, starting from the twelfth spot on the grid and crossing the wire in fifth place. In Race 2 the Aprilia Racing Team – Red Devils riders got off the line well when the lights went out, with Jordi in third and Leon in fifth. Without pushing too hard on a boiling hot track, they maintained a consistent pace looking after their tyres carefully. This was a factor which, from the midrace point on, allowed them to overcome their adversaries until moving into second place for Jordi Torres, followed by team mate Leon Haslam. There was no lack of excitement in the final moments with Leon braking hard in an attempt to overtake, an unsuccessful but highly spectacular move. Davies and the Aruba.it Racing – Ducati Superbike Team score their fifth SBK win of the season!